Volume trimming was one of the first and simplest techniques for fabricating ideal hinges using thick materials. We extend and generalize constant thickness volume trimming for layered fabrication processes. Previously, constant thickness volume trimming uniformly removed material local to each hinge, leaving layers near the hinge vulnerable to delamination. We provide a method to retain material on both sides of the fold line to create stronger hinges by varying the profile of removed material along the axis of the hinge, even for hinges with large fold angle. We also produced software to generate laser cutting files to print degree four vertices. 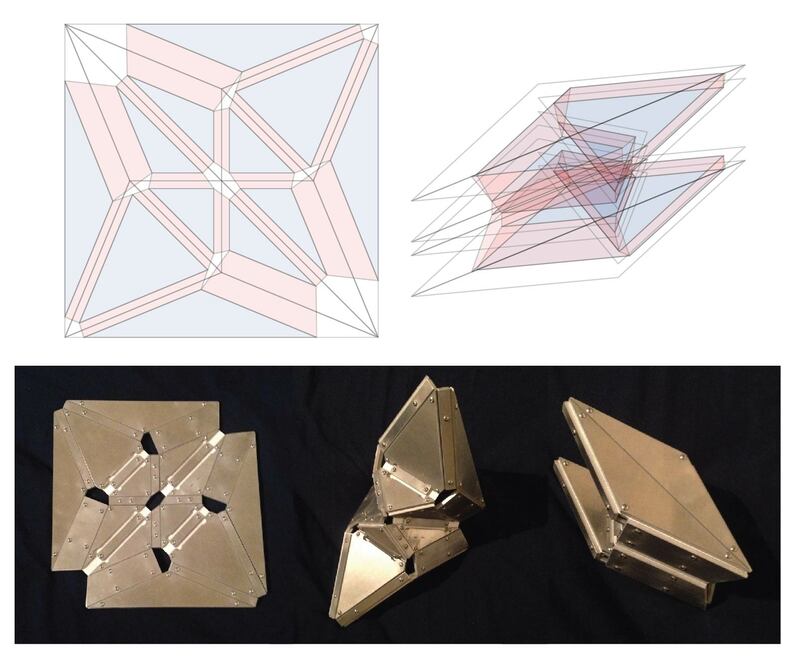 Designing structures folded from sheets is difficult, especially when the surface does not fold flat but folds into three-dimensions. We showed how to design three dimensional folded structures, if we are given a folding of the perimeter of the sheet. We also showed that multiple boundary conditions can be satisfied by the same crease pattern for a square boundaries. Here is a web application that finds a folding for a given boundary condition. For basic operation, press spacebar to construct a random folding that satisfies the input boundary folding. Press tab to change examples, or load your own OBJ. Folding is typically performed with thin, compliant material. If we want to make folding structures from thick material for engineering application, we must account for the volume of the material and avoid collision. 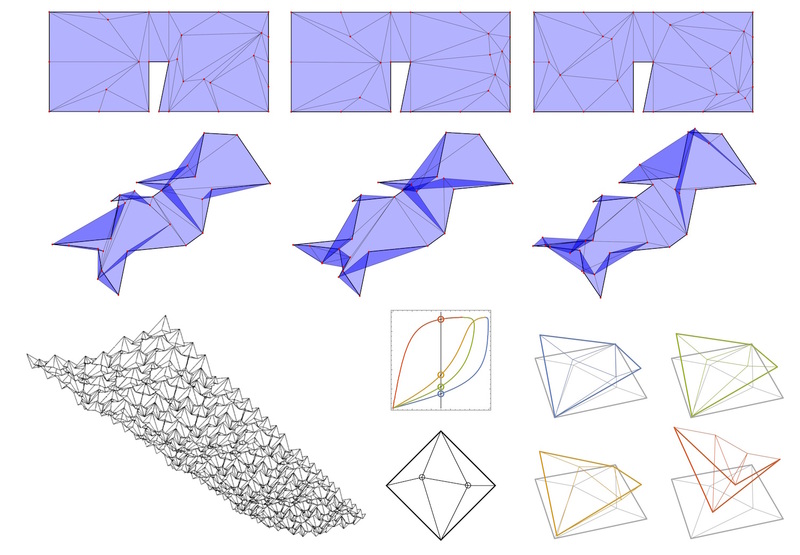 We proposed a new systematic and broadly applicable algorithm to transform certain flat-foldable crease patterns into new crease patterns with similar folded structure but with a facet-separated folded state. We proved that the modification of a degree-four vertex locally has a rigid folding motion from the flat to fully folded state. We also describe hinge fabrication techniques that are suitable for a variety of layered manufacturing processes. Here is a interactive simulation showing our algorithm being applied to a traditional folding pattern. Press up and down to adjust the thickness of the folding, and press 'f', 'c', and 's' to toggle visibility. Street lighting comprises a significant portion of municipal budgets. Many municipalities do not have adequate inventory of their assets, so monitoring is costly. We developed a mobile application to collect video and sensor data using a device discreetly mounted to the top of a vehicle. We used image processing and machine learning to perform feature extraction to locate street lights at night and during the day. We developed a new way of interpreting optical flow that can optimally combine many measurements to achieve high positioning accuracy. We tested this algorithm in a simulation environment written in Processing. Using an smart spectrometer, we were also able to estimate the power at each light from point luminosity measurements along the road, and classify the bulb type against a library of known bulb spectra. Data collection was performed in Swift on an iPad Air 2, while post processing was done in MATLAB. Monitoring street infrastructure is a slow and costly responsibility for municipalities. We developed a mobile application to collect video and sensor data using a device discreetly mounted to the front of a vehicle. We used image processing and machine learning to perform image stabilization and extract the road for projection onto the ground. 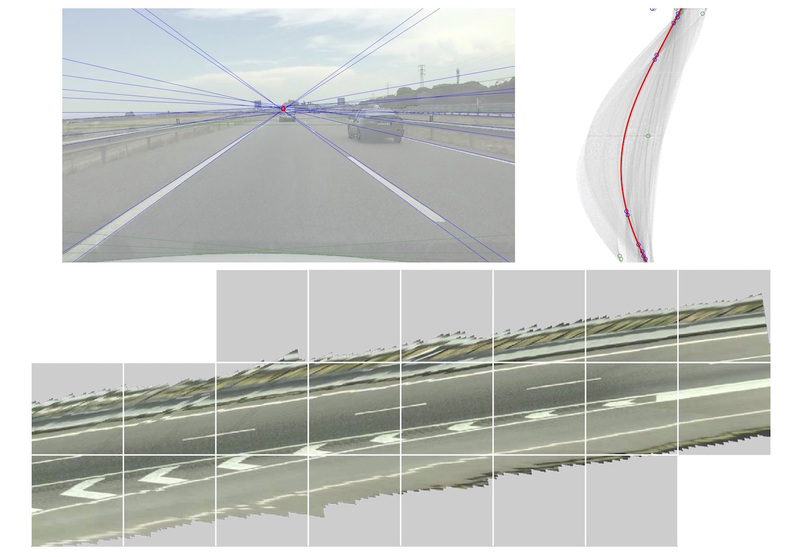 We could then stitch the projected images together to obtain centimeter resolution of the road surface which we store in a geotagged image library. Features such as road markings, cracks, and other visual deformaties can then be extracted from these image sets and monitored over time. 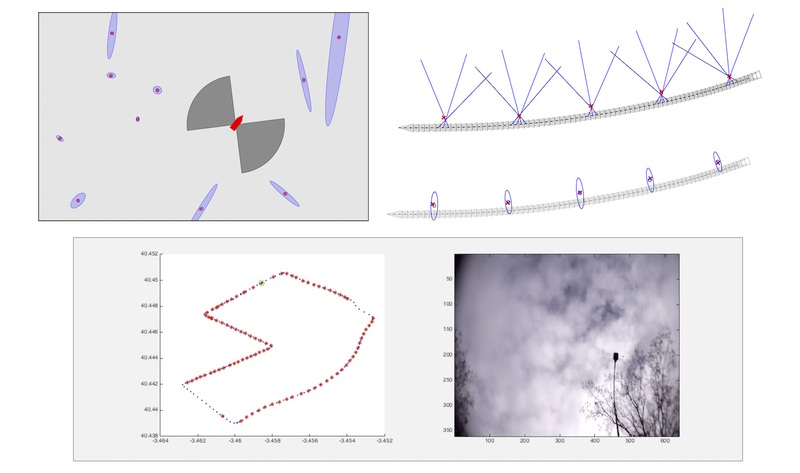 Data collection is performed in Swift on an iPad Air 2, while post processing is done in MATLAB. Conventional imaging can be difficult to perform if the space between the object and observer is filled with turbid media, like mist or muddy water. We designed and fabricated a custom AUV mounted underwater digital holography system to test reconstruction algorithms under adverse conditions. The imaging volume was illuminated with spatially coherent laser light, which interfered constructively and destructively with the media contained in the volume. Using this setup, we were able to image small aquatic organisms and track particulate flows through the volume in clear water, and test new algorithms to reconstruct the volume when immersed in turbid water. MRIs work by taking many pictures of your body from multiple angles, and tries to combine these two-dimensional pictures into one three-dimensional image. Tomography is the study of reconstructing a volume from lower dimensional projections.Very good reconstruction algorithms exist, but require many images to faithfully reconstruct a general volume. If the object being imaged is sparse, one can hope to do better. We show that a constant number of projections can faithfully reconstruct the object if it is a piecewise-linear 2D sheet embedded in 3D. The number of projections needed for reconstruction depends on the smallest angle between surface facets that needs to be resolved. The 'Holograms' found in Cracker Jack boxes simulate multiple images when viewed from different angles about a single axis, through the use of a series of cylindrical lenses. We constructed a prototype three-dimensional display that projects a different image depending on the direction viewed about two axes, to simulate a passive but interactive window into another world. The prototype is constructed from a set of spherical lenses with optimal constant index of reflection. For perfect resolution, gradient-index Luneberg lenses should be used. In 2007, The Opera of the Future group at the MIT Media Lab began production on a technology infused international opera. I designed and built the first full-scale prototype of a human-sized Operabot with omni-drive chassis, multiple independent LED systems, and a two degree-of-freedom articulating head.